I grew my handmade business to multiple six-figures. My sales per month are now what make in an entire year before B-School! Before B-School I was running three businesses and wasn’t exactly sure which business was going to have the most success; but I was sure whatever I would learn in B-school I could apply to one or maybe all of the businesses I had at the time. I was hesitant about investing in B-school because I wasn’t generating a lot of revenue monthly; less than $3,000 per month. I took a leap of faith and invested in myself. I didn’t have a lot of clarity and direction at the time. With my herbal business, Euphoric Herbals, in particular I was probably shipping about 60 orders a month. My product line still was very “homegrown” and I was experimenting with a lot of different things from product development and how to find customers. I was struggling with how to market my business both in my community and online. B-School gave me the insight to get to better know my customer and how to serve them better. I also realized that I had more to give to my customer than I realized and that my herbal business had far more potential than I knew. I believe the process of investing in myself allowed hidden potential and skills to surface. With my new clarity, I’m focusing solely on one business and no longer trying to “do everything” or offer “everything to everyone”. It brings a sense of tremendous freedom! In regards to my growth, I doubled my revenue from the previous year prior to B-School. After B-School, my business is projecting 5x revenue. I grew my handmade business to multiple six-figures. My sales per month now are what I did in an entire year before B-School! For any artisan and crafter this is tremendous. We now ship about 500 orders per month. Additionally, I have grown my team from one part-time assistant to 3 part-time assistants. I have now shipped to 37 countries and counting. The amazing thing is that all of this growth has happened without any paid advertising or affiliates at all, completely word of mouth! Lastly I have outgrown working from my home and I’m building a facility for my business. Whoa nelly! 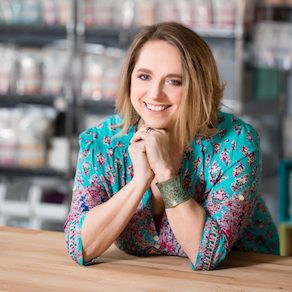 What surprised me the most through the process of B-School and my own evolution in my business; I had an epiphany to create a business & marketing course specifically for handmade artisans. I don’t believe any of this would have been possible without B-School!